I shall not mention the winter months, but suffice it to say that I am welcoming summer with extra-wide-open arms this year. In fact, I’m betting that more people will spend more time outside this summer than ever before. I know I will be. Craving sunshine on my shoulders, I’ll be out the door at the break of dawn to explore the city, returning home to the laid-back satisfaction of a backyard barbecue. I’ll be building up my vitamin D, and my memory bank, for use during that season that shall not be mentioned. Given this enthusiasm for enjoying the warmer months outside — and our growing food scene — we tasked our food writers with putting together their ultimate picnic spread, one that spoke to their favourite bites as well as their personal alfresco style. The results will treat readers to tastes from across the city and reveal the cravings of these four experts. 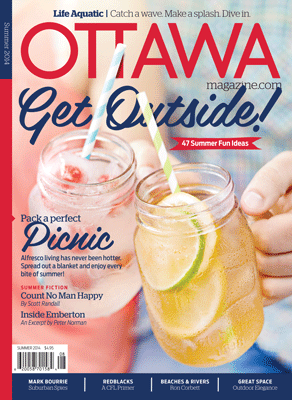 We round out the “Take It Outside” feature (page 57) with products, events, and books, plus a playlist of favourite summer songs supplied by city notables, in an effort to help you maximize your picnicking pleasure. I can’t close this letter without calling attention to the unique fiction offerings in this issue. Scott Randall takes us to all too familiar territory with a car-pooling story about retirement from the public service, while former Ottawan Peter Norman transports us to a mysterious empire with an excerpt from his debut novel, Emberton. It’s such a pleasure to indulge in short stories and novels. In fact, we had so much fun with it this year that we plan on hosting a short-story contest — the winners will be published in our Summer 2015 issue. Watch OttawaMagazine.com for details.